A historic journey from the tropical city of Townsville to the mining centre of Mount Isa, The Inlander offers the perfect opportunity to experience the heritage and natural treasures of North Queensland's rugged, yet beautiful outback. 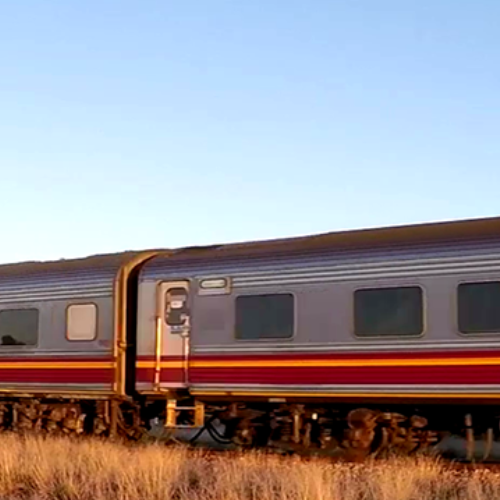 Departing twice a week in either direction, this 977 km trip, enjoyed in air-conditioned comfort, travels through Charters Towers, across the Great Dividing Range and through the mining towns of Hughenden and Julia Creek before delivering passengers into the heart of Australia. There is so much to do and see from Mount Isa including the prehistoric exhibits at the Riversleigh Fossils Interpretive Centre and tours of underground mines. While it may be hot and dry outside, the air conditioned Inlander has every amenity to make your journey totally comfortable. The dining car serves hearty Aussie meals while the bar and lounge are perfect for a relaxing drink with other fellow adventurers. Reclining Seats are in open saloon cars with an overhead luggage rack, individual reading lights, panoramic windows, with toilets and washbasins at the end of each carriage. Triple Sleepers feature three berths converting to seats during the day with a washbasin, reading lights and a power point. Blankets, lower sheets, pillows and pillow slips are provided for each passenger with showers and toilets available at the end of each carriage. Twin Sleepers (Twinettes) feature a washbasin, wardrobe, reading lights and a power point with bedding and towels also provided. Berths convert to seats during the day, with showers and toilets available at the end of each carriage. Single Sleepers (Roomettes) feature a washbasin, wardrobe, reading lights and a power point with bedding and towels also provided. Berths convert to seats during the day with showers and toilets available at the end of each carriage.